A couple years ago, I noted briefly the discovery of a 230-year-old Canadian birchbark canoe, believed to be the oldest surviving example, in an English barn. 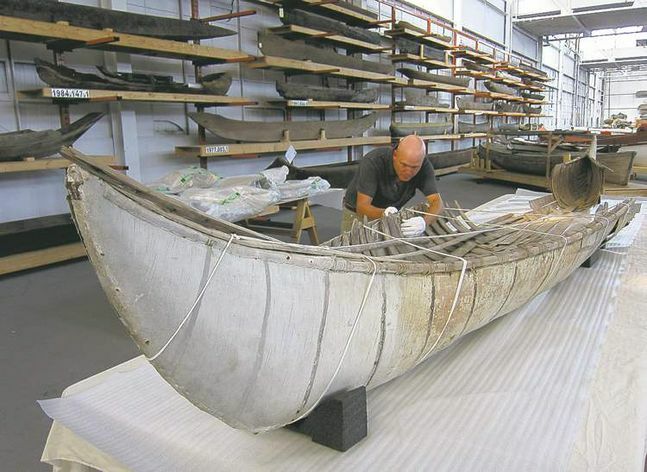 At that time, a plan had been announced to transfer it to the Canadian Canoe Museum for study and conservation. The transfer has now been effected, and there are two good articles, one in the Winnipeg Free Press focusing on the news of the transfer, the other, by bark canoe expert Henri Vaillancourt in WoodenBoat, focusing on the canoe itself and its history (after following the link, click the tab "Open Article" for a readable version). 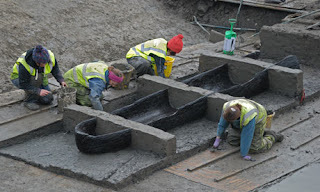 More recently, I noted the discovery of the remains of a Bronze-Age settlement in Whittlesey, near Peterborough, England, that included six dugout canoes. I recently came across an article in The Guardian/The Observer that included the photo above, a much better one than I could find for my earlier post. In addition to the thinness of the hull, indicating the sophisticated skill of the canoe's builder, the photo shows how the excavation left transverse beams of earth intact across the hull to retain its shape. In 1926, during a national craze for daredevil stunts, Al Faussett built a 32-foot spruce dugout canoe and successfully piloted (or perhaps just rode) it solo down Sunset Falls on the Skykomish River in Washington. The falls drop 104 feet over a distance of 275 feet -- quite a drop! 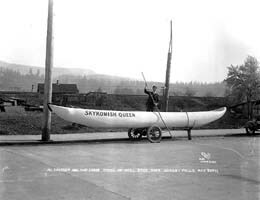 -- and Faussett wisely carved his canoe, Skykomish Queen, with a great deal of rocker for maneuverability. For details, see this nicely-written article on History Link: The Free Online Encyclopedia of Washington State History. Speaking of running rapids in dugouts: I recall a spectacular chase scene in the Robert De Niro film The Mission, in which Portuguese and Spanish soldiers pursue Guarani Indians down the Iguaza River in what is modern-day Brazil. The Indians are paddling dugouts, and their capabilities in heavy whitewater were most impressive. Wish I could find a clip of this scene on YouTube. Reconstruction of the Quanzhou ship. Note bulkheads, stern rudder that can be raised with a windlass, and V-shaped hull. Click any image for magnified view. A large ocean-going ship discovered in 1973 forced a reconsideration of the history of Chinese shipbuilding. Its method of construction was different from all more modern examples of junk construction, and it employed an extraordinarily complicated system of planking, combining several layers and several planking methods. Discovered during a canal dredging project near the port of Quanzhou, the ship has been dated to 1277 A.D. Thought to have been 112 feet (34m) LOA, 36 feet (11m) broad, 380 tons displacement and rigged with three Chinese lugsails, she was a huge ship by the European standards of the day. (The Bremen cog, 100 years later, had a single mast and 130 tons displacement.) But what makes her important from our perspective is the fact that she was built with a keel and a V-shaped bottom. Ever since Europeans and Americans began carefully observing Chinese vessels in the 19th century, the invariable norm had been keel-less construction with flat bottoms. The ship was built before the Ming Ban, also known as Haijin, an ill-advised law first implemented in 1371 that eliminated a thriving merchant marine in order to curtail piracy. (This is kind of like killing your horse to prevent it from becoming lame). The shipping ban was subsequently lifted, reinstated, and finally terminated for good in 1567. It is not surprising that, with such a long hiatus, shipbuilding methods showed a distinct break. Like more modern Chinese ships, the Quanzhou ship was divided by bulkheads -- 12 of them, creating 13 compartments of roughly equal size. 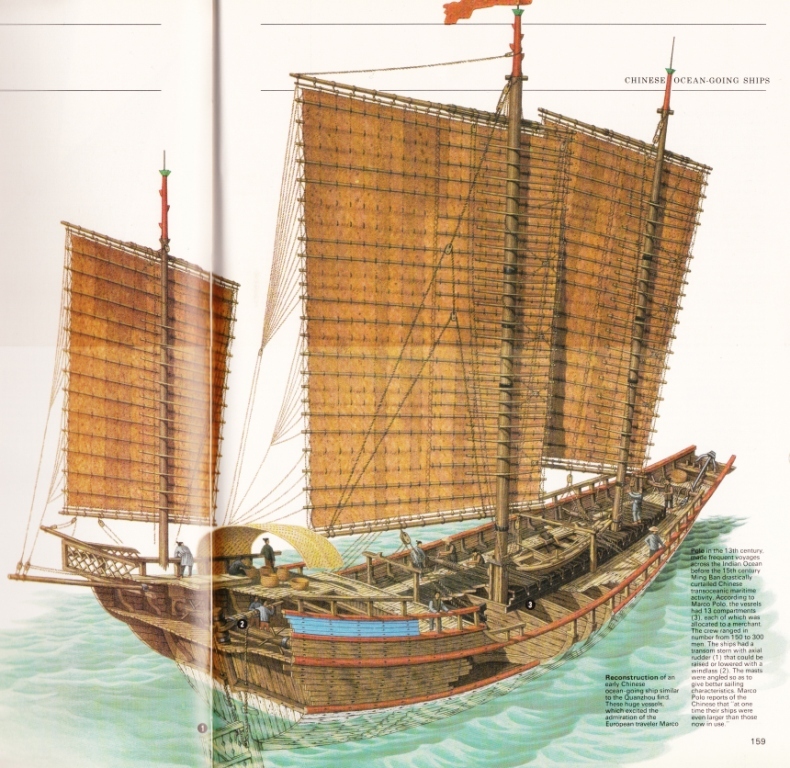 According to Marco Polo, who was in China at about the same time that the Quanzhou ship sailed, each compartment would be chartered by a different merchant -- a practice that has certain similarities to the modern containerization of break-bulk. On more modern junks, such compartments were always observed to have been watertight and, indeed, much of the contemporary appreciation of Chinese shipbuilding is based on the notion that the Chinese invented the watertight compartment. But on the Quanzhou ship, the bulkheads were pierced with limber holes that would have allowed water to flow from one compartment to another. A possible advantage of this arrangement is that the bilge can be pumped from a single point, but the disadvantages seem obvious. The bulkheads were caulked, however. In the event of a hull breach, perhaps the practice was to plug the limber holes and thus restrict flooding to the affected compartments. I do not know the shape or size of the limber holes, however, and with a full cargo they would have been difficult to access in an emergency, so I don't claim this to be a strong speculation. 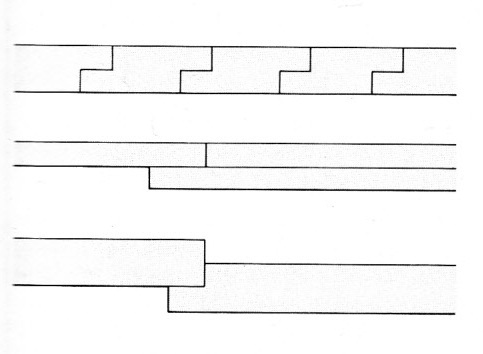 Cross-section of the Quanzhou ship showing keel-based construction and complex planking method with multiple layers. Perhaps the most interesting aspect of the Quanzhou ship is its complex planking, which combined aspects of half-lap, ship-lap, carvel and lapstrake methods. 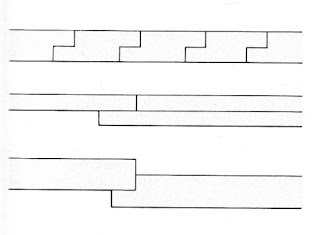 As shown in the cross-section, the innermost layer of planking consisted of groups of three strakes, the lower two having ship-laps on both edges, and the upper one having a square upper edge. The frame was rabbeted half the thickness of a plank, so that the rabbeted lower edge of first strake of the next group sat neatly over the upper, non-rabbeted edge of the strake below it. The Quanzhou ship used three planking methods in a complex combination of layers. According to Marco Polo, when a Chinese ship needed plank work, the procedure was to add new layers of planks right atop the old ones, up to six layers total. Perhaps the Quanzhou ship was not originally built with such complex planking, but "grew" that way as shipwrights added planks using their own preferred method over years of repairs. During the past two months, an unusually heavy workload and change of employment prevented me from posting to Indigenous Boats. I apologize for "going dark" for such a long period, and thank you sincerely for your patience and loyalty. Source of images and most content: The Sea Remembers: Shipwrecks and Archaeology : From Homer's Greece to the Rediscovery of the Titanic , ed. Peter Throckmorton.